GREENSBORO, N.C. (seminoles.com) – Seminole junior Lydia Gumm shot a final round 72 and finished in a tie for 24th in the individual standings and Florida State finished in ninth place in the team standings as play in the ACC Women’s Golf Championships at the Sedgefield Country Club came to a close. Gumm and fellow junior Matilda Castren finished with identical scores of 224 and finished tied for 24thplace in the individual standings to lead the Seminoles in the annual conference championship. No. 18 Virginia led the event wire to wire to capture its second consecutive ACC Championship with an 11 stroke victory over second placed Wake Forest and a 28 stroke advantage over third placed Duke. The Cavaliers carded the best team scores of the first and third rounds, were the only team to finish with an under par team total and won the ACC Championship by a double digit stroke advantage for the second consecutive season. Lauren Coughlin of Virginia won the individual championship with a three-round total of 207. She carded under par scores of 66-71-70 in each of the three rounds to win the championship. Coughlin was the only player in the 60-player event to card three straight scores of under par golf. 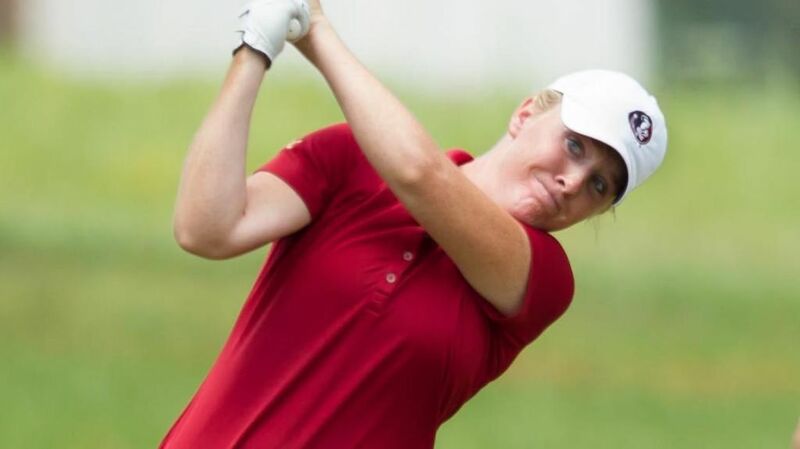 Gumm (Radcliff, Ky.) played her best golf of the tournament as she carded a personal tournament high three birdies in finishing with her even par score of 72. She played her best golf of the tournament on her second set of nine holes (the Seminoles began the day from hole No. 10) as she was 1 under par with two birdies and eight holes scored a par or better. Gumm was never more than one stroke over par and she concluded play in her third career ACC Championships appearance with a birdie on her final hole of the day. With her third round score of 72, Gumm improved her position in the individual standings by 10 places after finishing the second round in a tie for 34th place. Gumm’s tied for 24th finished in the 2016 ACC Championships marked her third consecutive top-25 finish in the event. She finished in a tie for 22nd as a freshman and in a tie for eighth as a sophomore. In finishing tied for the team lead on the leaderboard, Gumm has now finished as the Seminoles’ leader six times in her career including in the 2015 and 2016 ACC Championships. Castren (Espoo, Finland) carded a 3 over par score of 75 in the final round and finished in a tie for 24th place with a three-round total of 224. She carded a personal tournament high of three birdies and 12 holes scored a par or better. Castren finished at 1 under par with one birdie and four holes scored at par on her final five holes of the afternoon. Seminole sophomores Kim and Morgane Metraux (Lausanne, Switzerland) played their best rounds of the 54-hole event with identical scores of 74. Kim Metraux’s 74 in the in third round included two birdies and allowed her to finish with a score of 226. Morgane Metraux’s score of 74 in the third round included a team-high four birdies which allowed her to finish with a score of 228. Forida State will now await the announcement of the NCAA regional championships which are scheduled for May 5-7 at four sites around the country. The Seminoles will certainly earn their school record 11th consecutive NCAA appearance when the teams are announced on April 25. The four sites are Birmingham, Ala., Baton Rouge, La., College Station, Tex., and Palo Alto, Calif. The NCAA Championship finals are May 20-25 at the Eugene Country Club in Eugene, Ore. The Seminoles, meanwhile, will continue their preparations for the semester academic exam period which begins April 25. NOTES: Lydia Gumm’s score of 72 marked the fourth time in her last six ACC Championships rounds that she finished with a par or better score…Gumm and Matilda Castren finished tied for the team lead with seven birdies during the three round event – including three each in the third and final round…Gumm and Castren competed in the ACC Championships for the third time in their careers, Morgane Metraux and Kayla Jones for the second time in their careers and Kim Metraux made her first career ACC Championships appearances…Castren was one of 16 players in the 60-player field to finish the event with an even par score of 3.00 of the par three holes…Gumm (34 of 56 holes scored at par) and Kim Metraux (33 of 56 holes scored at par) were among the 22 players in the field with 33 or more holes scored at par…Castren (72.77) and Kim Metraux (72.97) enter the NCAA regional championships with the two best scoring averages on the team…Metraux and sophomore Kayla Jones are the only the Seminoles who have played in each of Florida State’s 11 tournaments this year.